According to nearly 70 percent of Realtors®, home prices will continue to stabilize or increase in the next six months; President Obama's approval rating falls to 42 percent among Realtors®. According to HomeGain's August survey, 46% of Realtors think home prices will remain the same over the next six months, vs. 31% who think prices will decrease and 23% who think prices will increase. HomeGain®, the first website to provide free instant home values, today announced the results of its quarterly Home Prices Survey of Realtors® based on the responses of 1,084 U.S. real estate agents and brokers. The third quarter survey shows that 69 percent of Realtors think home prices will either stay the same (46 percent) or increase (23 percent) in the next six months. Compared with HomeGain's second quarter survey, 71 percent of Realtors thought home prices would stay the same (49 percent) or increase (22 percent) versus 45 percent of Realtors who thought home prices would stay the same (36 percent) or increase (11 percent) in the first quarter survey. According to the third quarter survey, 38 percent of homeowners believe that their homes should be listed 10 to 20 percent higher than what their Realtors' recommend, up from 36 percent of homeowners who believed so, but down from 45 percent in the first quarter. Sixty-four percent of home buyers think that homes are overpriced, unchanged from the second quarter and up from 59 percent of home buyers who thought homes were overpriced in the first quarter. Seventy-three percent of home sellers believe that their homes are worth more than their Realtors' recommended listing price, up from 69 percent in the second quarter survey and 71 percent in the first quarter survey. The survey showed that while home sellers still believe their homes for be worth more than their Realtors say they are, they have tempered their price expectations. In the current survey, only seven percent of home sellers believed their homes were worth 21-30 percent more than their Realtors' recommended price versus 14 percent who so believed in the first quarter survey. "The third quarter HomeGain Home Prices Survey of Realtors reveals a continuation of the stabilization trends that became evident in the second quarter survey," stated Louis Cammarosano, General Manager at HomeGain. "The vast majority of Realtors expect prices to remain the same or increase in the next six months. Buyers continue to believe that homes are overpriced and expect bargains, while a greater percentage of sellers, perhaps emboldened by stabilizing conditions, think their homes should be priced higher than their Realtors are recommending." "Due to the lower inventory, I feel that we will see increases in home prices in the next six months," commented Sue Vaterlaus of RE/MAX Star Properties in Pacifica, California. "We have a lower number of foreclosures now, which were bringing down the prices in the past." "I believe that we are close to the bottom in home price corrections and that we will see a much more robust marketplace in 2010," stated Lynn "Peanut" Newcomb of Property & Mortgage Network, Inc. in Bellevue, Washington. "I expect the El Paso market to turn upward during the second half of this year due to a large demand for housing from a huge influx of military troops to the area and by the $8000 tax rebate," noted Barry Karch of Prudential BKB, Realtors in Texas. Marilou Strickland of Lamprey River Real Estate in Raymond, New Hampshire, commented: "While home sellers accept that the market has a decreased value, they believe their property is the exception and it's still a struggle to convince them to list their houses in the right price range. Eventually, they lower their price and the house sells." Forty-two percent of Realtors surveyed indicated approval of Barack Obama's performance as President, down from 57 percent in the second quarter. Forty percent of surveyed respondents 'strongly disapprove' of the President's performance and 18 percent 'somewhat disapprove', earning the President a 58 percent disapproval rating. The President fared slightly better in the nationwide Rasmussen Daily Presidential Approval Index taken during the same period as the HomeGain survey, with his approval rating hovering in the 47-49 percentage range. 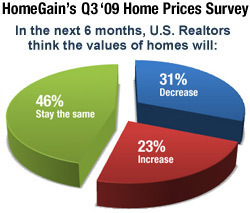 The third quarter HomeGain Home Prices Survey of Realtors was conducted from August 11-17, 2009. For complete survey results, including regional breakdown and real estate agent commentary, read the blog post, HomeGain Releases 3rd Quarter Home Prices Survey of Realtors® Results, on the HomeGain Real Estate Blog. Listen to survey respondents discuss the survey questions during a live teleconference call on Tuesday, August 25, 2009, at 9:00 AM Pacific Standard Time at https://homegain.webex.com/event.